The next Academic session will start on 31st July 2019 for which we are accepting applications. 2. Eligibility Criteria: Graduation in any Discipline. There is no minimum percentage required to apply. Students who are appearing in their Final Year Exam of Graduation can also apply. 7. Hostel facilities: We don’t have a hostel, but we help u to find economical accommodation near the institute. Generally room cost between Rs. 4000-4500/- per month which on sharing basis will cost around Rs. 2,000/- 2500 per month. There is food joint near CRAFT where most of the students have their lunch and dinner. For girl candidates we help in finding P.G accommodation which cost around Rs 3500/-per month. Food is separate and there is Tiffin arrangement available. Rs.1,00,000/. The first installment is 50% of the total fee at the time of submitting the admission form. 10. Course Duration: English Journalism is a one year program. First semester of 6-month is class room training along with practical projects and 2nd semester of 6- months, 3-months for the field projects and 1-3-months is the Guaranteed internship in news Television station based in Delhi. In this country no university offers the “bachelor or master degree in TV Journalism ,News Reading and Anchoring / or any other specialization media courses like direction, event mgmt, editing…..etc”. 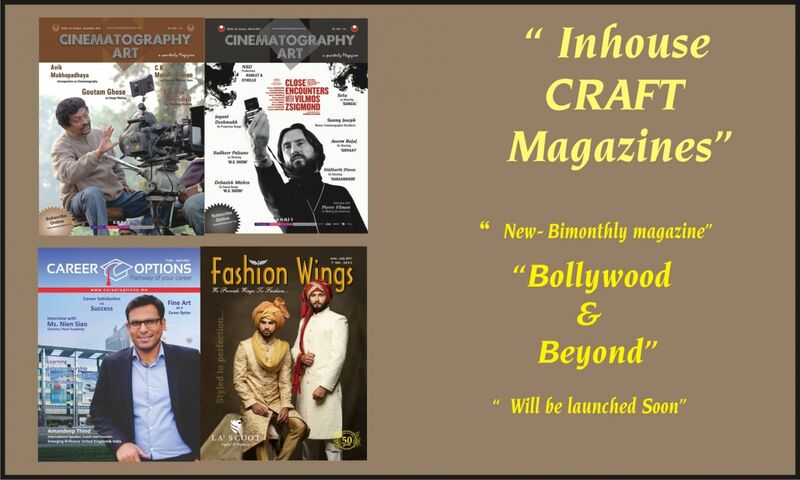 * Cinematography Art: quarterly Magazine running for last 4-years. * Fashion Wings - Bimonthly Magazine recently announced. Besides the regular lectures of 2 hours , every day students get the "Practical Training" of 3-hours to work on our in-house Magazines.